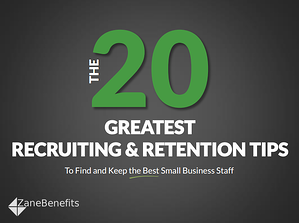 Zane Benefits, the leader in individual health insurance reimbursement for small businesses, announced today the publication of a new eBook, "The 20 Greatest Recruiting & Retention Tips." The guide helps small businesses find and keep the best employees. According to Zane Benefits, small businesses don’t have the time or resources for elaborate recruiting and hiring strategies. At the same time, they can’t afford to lose key employees to competitors. So, how can small businesses find and keep the best employees on a limited budget? According to Zane Benefits, owners and managers need to be smart about how they allocate their time and money. The new guide boils down hundreds of industry trends, best practices, and ideas into the 20 greatest recruiting and retention tips. The guide is designed to help small business owners, CEOs, and managers find and keep the best employees.